No, this isn’t water skiing related, but it is a relatively new Christmas. This dates back all the to 2005 when Carson Williams put together this little light show for his neighborhood. I’m not sure if it was that year or next, but Miller picked it up for their holiday beer advertising. Then the following year they tried to create their own, but it wasn’t nearly as good as the original. Tonight, after a busy day mowing the lawn, cleaning, doing laundry and watching the Badger’s win their first game of the year, I caught up with my old friend Brent. He’s in the navy now, so I don’t get to see him very often, so it was good to catch up with. We stopped at BW3’s first for some food and our first frosty beverages of the night. Then we headed to the UW Memorial Terrace for another beverage. They usually have a band playing there as well, which is always nice, but tonight, they really had a band. A very good band. They weren’t playing your typical music though. The band was Orleans Avenue, a project of a musical virtuoso named Trombone Shorty. If you read up on the guy, he’s been “leading bands” since he was six years old. He’s that good. And after watching him in person, he is. My reaction was wow. His band that he plays with is really good too! Initially, I’d think to describe the music as Dixie Land Jazz… but there more to it than that. Way more. A little funk, a little bit of a rock edge and a whole lotta fun. He manages to get a crowd of Wisconsinites up on their feet dancing and singing along to the song “When the Saints.” Yes, we all know the song, everyone does, but to get a huge crowd up and dancing and singing… now that is a very big feat in my eyes. The crowd loved it. And then after that, he busts out the next song… “Back in Black”. Everyone knows the riff that opens that song. Everyone. Well, you haven’t heard that riff until you’ve heard it done on a trombone. Wow! The song will never be the same. If you ever get the chance to catch this act, do it. You might be thinking that the music doesn’t sound like something you like. I would think the same thing and I’d know I was wrong. The music is great. My buddy Brent and I at the end of the night. We’ve known each other since we were like 6 years old. As some of you know, I have an HD TV now. Works great. DirectTV carries HDNet and HDMovieNet, both great channels. I have found one thing that shouldn’t be shown in HD. Old school metal hair bands. I’m not picking on Whitesnake in particular. I saw that they had an hour long concert airing on HDNet, so I recorded it. The songs of their’s that I recognized, they did a really good job with. They nailed their power ballads “Is This Love” and “Here I Go Again” and jammed out to “Still of the Night”. There are just some things that don’t need to be seen in HD. First off, style wise, I don’t think they’ve changed since the 80’s in regard to their dress. Like Jerry Seinfield said (paraphrased), they found a look and they’ve stuck with it. But underneath their big hair, they have old wrinkly faces. It just doesn’t look quite right. You think they’re 20 somethings and they you see they’re not. And HD makes it very evident. The band isn’t the worst part. Just like the band, the crowd looks like the are all dressed from 80’s and they don’t look nearly as good. Some looked done right scary. Remember how when old people would try and dress up like rockers from the 80’s back in the 80’s, well these are the rockers from the 80’s and now they’re the old people. If you want to see them in all of their glory, go check out the video for “Here I Go Again“. Guys, it has Tawny Kitaen in it. Gotta watch it. So I recently joined the realm of HD TV with a recent purchase and managed to find myself an over the air broadcast channel that actually plays music videos* and doesn’t really have commercials. Granted the channel, called The Tube, isn’t in HD, but it plays good music. Billy Idol, Green Day, Springsteen, Modest Mouse and Gnarls Barkley (they like their variety). Anyway, the Barkley video for Gone Daddy Gone, a Violent Femmes remake (aka cover), came on and I loved it. Good rendition of the song and a hilarious video. Enjoy. *Music videos became popular in the 80’s. MTV rode their popularity and became a major TV network brainwashing millions of teenagers into some poor choices regarding their music (and still does). Fortified in it’s position of power, MTV stopped playing videos but somehow still calls itself a music channel even though the vast majority of it’s programming is now based on reality TV (or at least as close to reality as MTV will ever get). They also started M2 to play music videos since MTV(1) wasn’t playing them anymore. M2 stopped playing them as well. Maybe they have an M3 that plays videos? I don’t know. **With ski season finished (I put the boat away last weekend) I’m still trying the throw a water skiing reference in now and then. Admittedly, this one is weak. Look for a full recap of this summer’s adventures coming soon. Want to know how many sets I took, how many trips to the lake, etc? I want to know and we’ll find out together in a couple days. BTW, I got a little link happy in the post. Photo from Violent Femme website. He takes the stage about 930/1000. Largest (by far) Pat Show of the year. Usually several thousand show up for this one. At least on the blog. 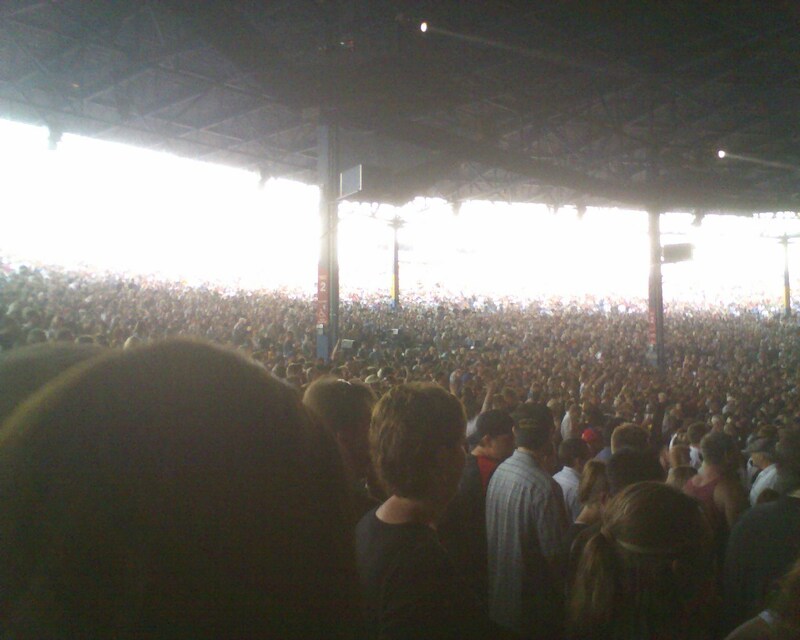 I listen to them near constantly… I was looking out at YouTube to see if there were any clips from the Milwaukee shows. I didn’t see any, but did find these two clips… The first is rather funny. The second is just a great song. Enjoy. There’s the ticket. Row Y, which surprisingly isn’t the 25th row. Closer to the 20th actually. Section one was stage left. I would have liked more towards the center, but these are still pretty damn good seats. Here’s the seating chart so you can be the judge. The show was billed as two headliners, but that obviously wasn’t the case. After watching both performances, one could easily see that it was Petty’s setup. They made use of the video screens and much better use of the lights. 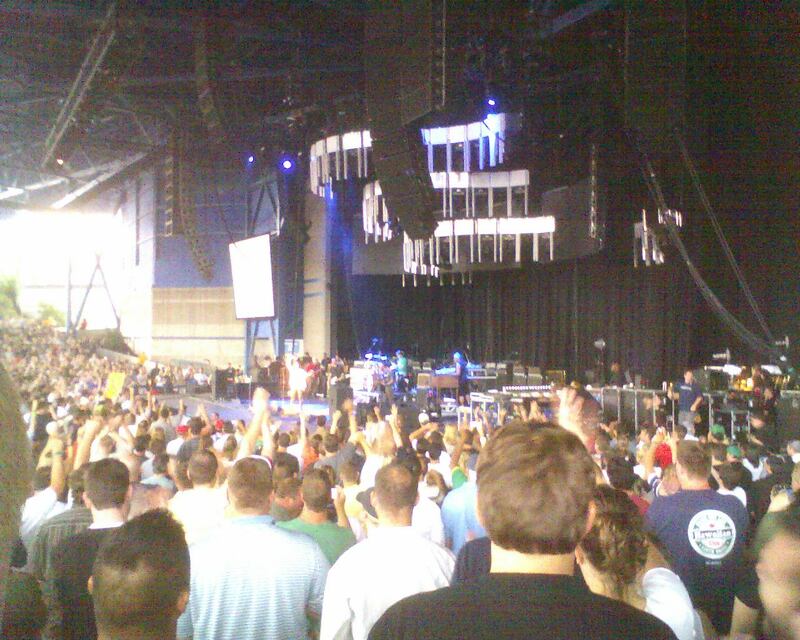 Pearl Jam opened. Set list was very good but I thought missed at least one significant staple and that was Betterman (looked and it was played the night before). Based on what I heard, there was very little overlap with the previous night’s set list. I had also heard the sound quality for Thursdays show was horrible (this was probably due to the power outage and not being able to do a proper sound check). 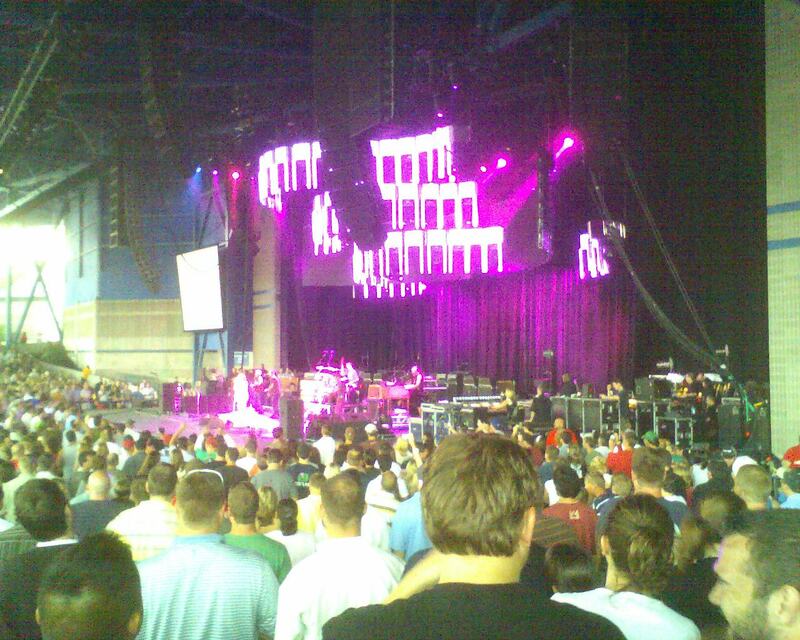 I thought the sound was in the good to very good range for Pearl Jam’s portion of the show. Some of their faster/louder songs could have used a touch more volume to the vocals, but on a whole, it was well done (I’ve heard much worse). I would have really like to have heard 25 Minutes to Go (Johnny Cash cover that they’ve done in the past) and Crazy Mary (also played the previous night), but they did a very good mix of old, new, popular and some of the lesser know material. I liked the new arrangement of Insignificance that they did and can’t wait to here it again to really compare it to their normal arrangement. That song is favorite of mine. My only complaint about the Pearl Jam portion of the show… their set was too short. They played about 90 minutes. If the show had started at 730 as advertised, it would have been a two hour set instead of 90 minutes. That is the only thing that pissed me off. Pearl Jam has just taken the stage. 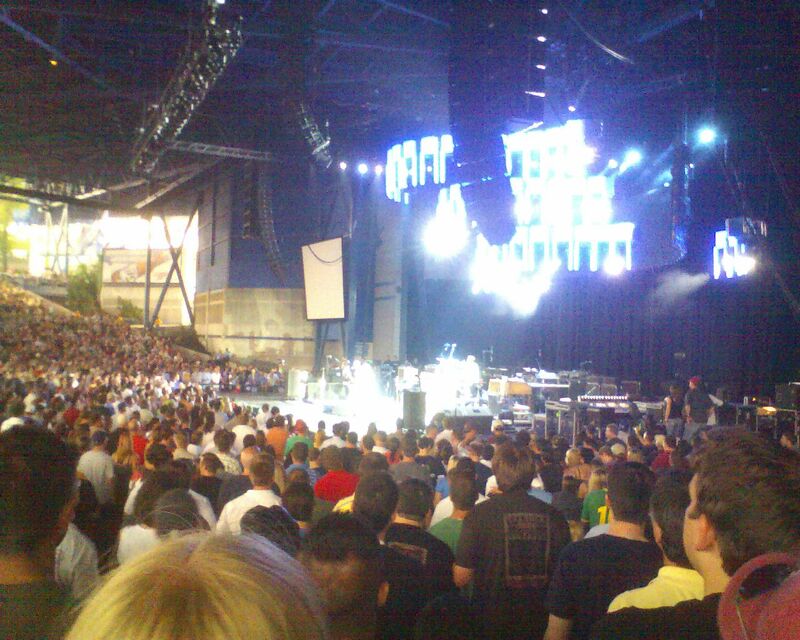 Another shot of Pearl Jam on stage. Here’s a shot of the crowd. 23 thousand strong! 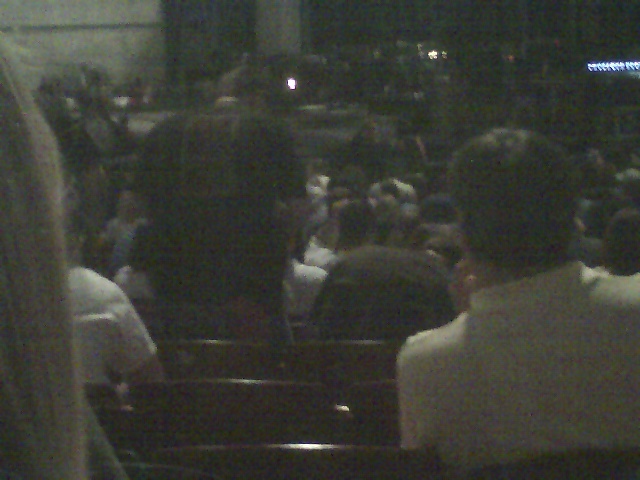 the back (a Tom Petty tour shirt). Tom Petty. Petty’s portion (that’s Tom Petty and the Heartbreakers for those who don’t know) was a very good show. Sound was about as good as one can get at a concert. It was dead on. Not something I would go see, but I was glad that I did. The guy has been churning out hits forever and he played them all. I didn’t recognize a cover they did and their new song, but everything else he played was a classic. He’s been doing this forever and he knows how to do it. I did get tired of him saying “Thank you” to the crowd after every song and I have to wonder how he can sing so well when his voice is just so awful. The set list contained everything I thought it would ,and from the sound of it, was nearly identical to the previous nights show. Eddie Vedder joined them on stage for a couple songs, including the closer, American Girl. Vedder did a great job on both songs he helped with. Petty on the stage. More lights. Video screens, etc. 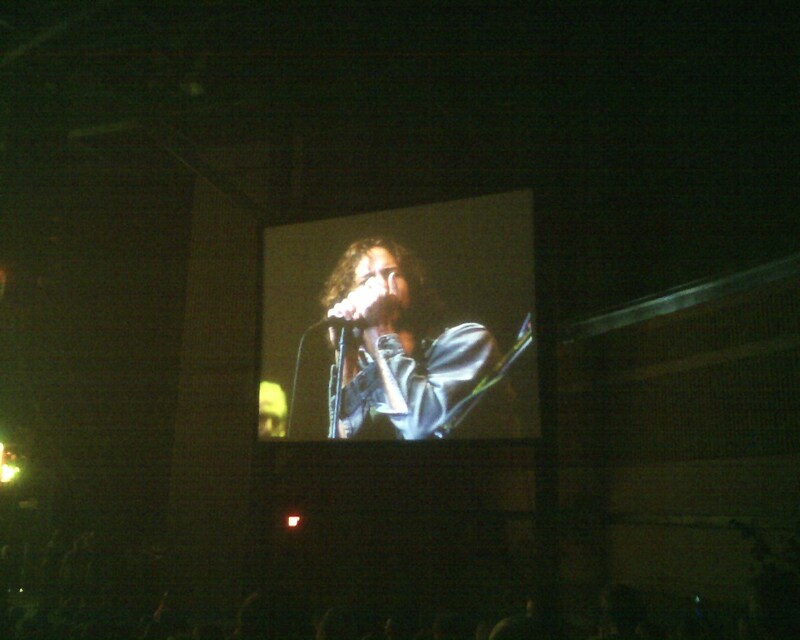 Vedder singing with Petty and the Heartbreakers. On the video screen. All in all, one hell of show. As I mentioned before, my only complaint was Pearl Jam didn’t play long enough. It would have been nice if they had made use of the video screen, but my seats were close enough that I didn’t care too much that they didn’t. Day started off great. Woke up after 3 hours of sleep and went skiing with John, Sandy, Ronee and Jonas. Perfect weather, perfect company, lots of skiing. Only thing wrong with the skiing portion of the day was I had to call it about 1230 so I could head to home to get my back fixed and then head to the concert. I could have spent the whole day on the lake easy. Would have like to as well. Why the 3 hours of sleep? After practice the night before, the older members of the ski team stuck around, had some beers, went to the Memorial Union, had some more beers, went to BW3s and ate. Good times were had by all. I found out the union carries Stella Artois (which is a beer I love- ask me about my first experience with it, it is a good story). Bell girls. There most be something about my boat, the Bell girls, and nearly losing some water skiing equipment. I had the issue with my wet suit falling off the boat into the lake. Well Sandy left her barefoot suit and shorts on my swim platform and I was on the ramp to the interstate when she called. “My suit and shorts are still on your swim platform, I hope.” I pulled over once on the interstate, checked, and luckily, they still were on the swim platform, barely. Beer Man. To the guy that walked buy me carrying many beers several times… When I jokingly said “it’ll cost you one beer to get by,” thank you for the beer. It hit the spot. Orton? The group of people seated directly around me pretty much came to the consensus that Kyle Orton (the Chicago Bears quarterback, formerly of Purdue and thorn in the side of the Badgers) was sitting five rows in front of us in Petty tour t-shirt. He really got into Pearl Jam, spilling $5 beers all over himself. I saw him tip one beer up to drink it and the cup wasn’t even on his mouth. Needless to say, he missed. He pretty much passed out during the change from PJ to Petty. And I mean passed out. He was dead to the world. When Petty did take the stage, he started to move after about a song or so and started pouring more beers down his shirt again. In the picture to the right, we believe the guy just to the left and several rows in front of the guy in white shirt on the right side of the picture is Kyle. Tough to tell with this photo, but he looked like he was passed out. Ten Clubers. To the couple sitting to my left, I doubt you’ll ever read this, but I still think I recognized the girl from somewhere. The face, the body, the voice, all seemed way too familiar. After talking, it is doubtful we’ve ever met because they are from ‘burb down by Chicago, hasn’t spent much time in Madison other than a visit or two and didn’t go to UW-Whitewater, but they had also been to the Alpine Valley shows in 97, 01 and 03 just like me. And like me, the joined the fan club in 97 after getting lawn seats to the show. 3rd Best Pizza. Pre-concert, we stopped at a bar near by buddy Al’s house called Rookies something or other. As I walked in, I heard the bartender mention “we have the 3rd best pizza in Milwaukee”. I had it. I’m pretty sure I could walk around downtown Milwaukee and find 3 better pizza’s easy. Nothing to write home about. Basic bar pizza in my opinion. Not great, not bad, just bar pizza. It did have a couple really spicy spots. I know my pizza is better than it, but it isn’t in Milwaukee. Al. For my buddy Al, I’m still waiting for your comments about this show and how it compared to Thursday’s. dr_r0ck. For Al’s buddy dr_r0ck that feels that the Marcus is horrible venue for concerts… basically a large venue for concerts that is acoustically good doesn’t exist. Once you get past a couple thousand seats in a legitimate theatre (where plays, musicals, opera and orchestra are performed) the acoustics go to crap. They don’t build arenas with the acoustics in mind, unless they are thinking about how they can make the crowd noise louder for basketball or hockey. The amphitheatre design used at the Marcus (23,000 fans) and at Alpine (36,000 fans) is actually one of the better setups for acoustics for a large crowd. Much better than a basketball arena for football stadium. Basically it comes down to the sound engineer that travels with the tour to figure out how to make the sound actually sound good in each venue. Some of these guys are good and some are not. From my experience, most are not. The sound engineer mixes the concert and sets the volume levels. He can make (Green Day, Pearl Jam, Beastie Boys, Elton John, Billy Joel & DMB) or break (Tim McGraw, Kenny Chesney, Tim McGraw and Faith Hill) a concert. Don’t blame the venue, blame the sound engineer. 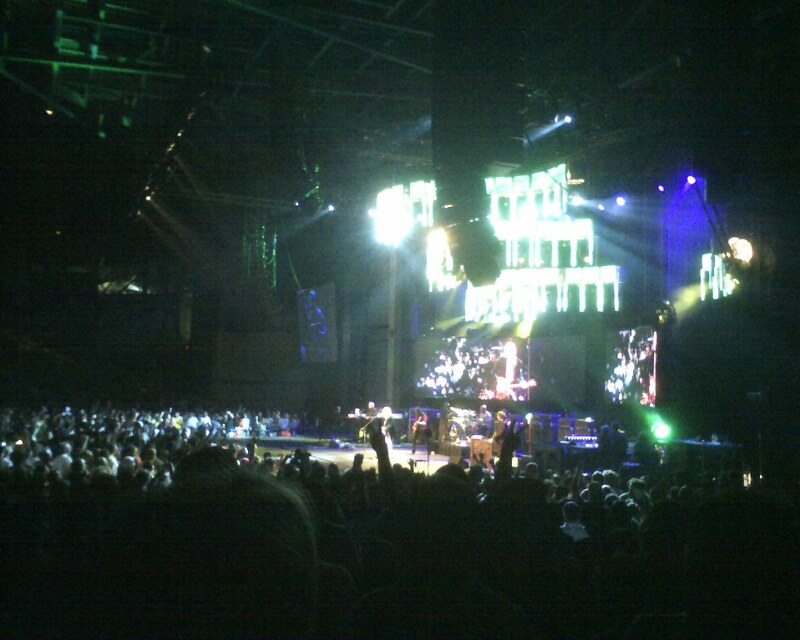 You can read more of an old rant about bad concert mixes here.